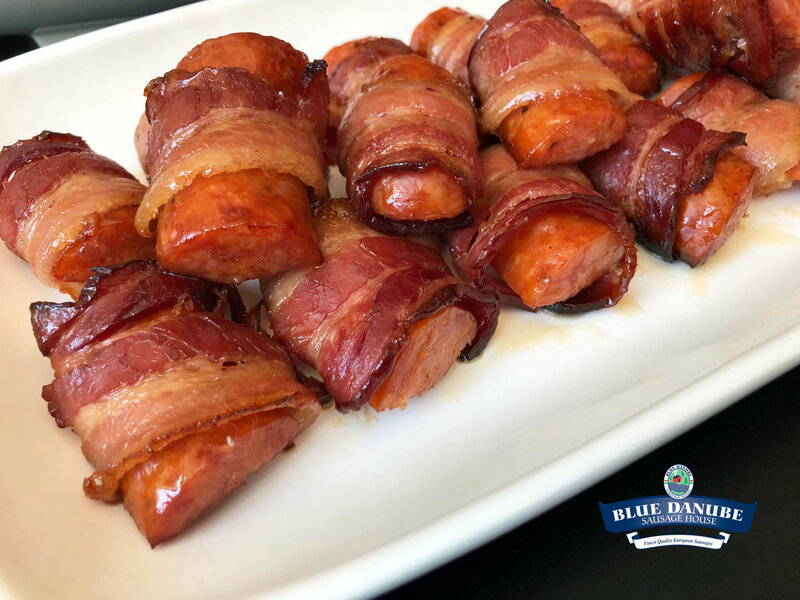 Sweet Bacon-Wrapped Sausage Bites — Blue Danube Sausage House Ltd.
Our Mini Sweet Bacon-Wrapped Sausages are perfect for sharing, although you may not want to! 2. Cut Blue Danube Mild Debreceni Sausages in half lengthwise. Then, cut each half into three equal pieces. 3. 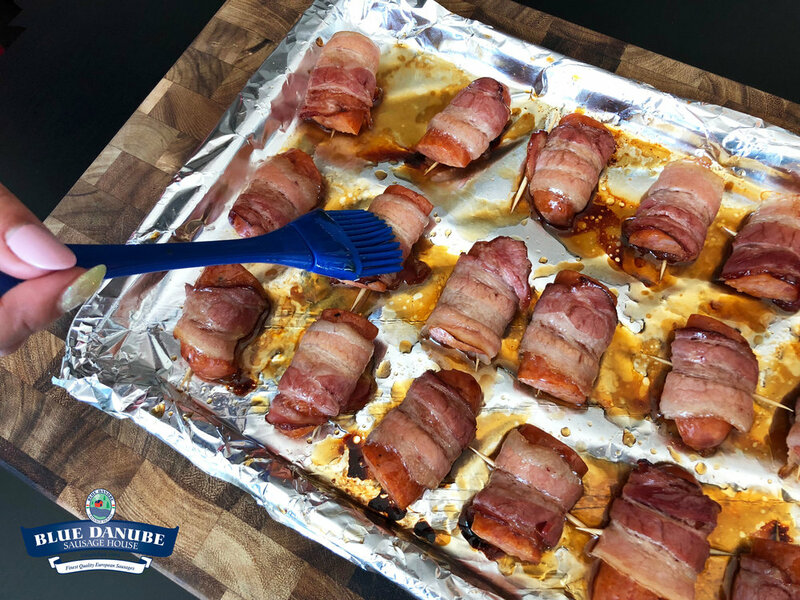 Cut each strip of Blue Danube Naturally Smoked Side Bacon in half. 4. Make the Sweet Brown Sugar Glaze. In a small saucepan, mix Coca Cola and Brown sugar together. 5. Place saucepan on the stove on medium-low heat. Stir often and heat until mixture is smooth and flowy (approximately 10 minutes). Keep mixture warm on low heat. 6. Cover a baking sheet with aluminum foil and spray a thin layer of non-stick spray. 7. Take one half-piece of Side Bacon and wrap around Debreceni Sausage. When putting the Debreceni onto your baking dish, try to tuck the Side Bacon ends on the bottom of the sausage so that they stay in place. If this does not work, use a toothpick to secure. Wrap all pieces of Debreceni with Side Bacon and place on tray. 8. 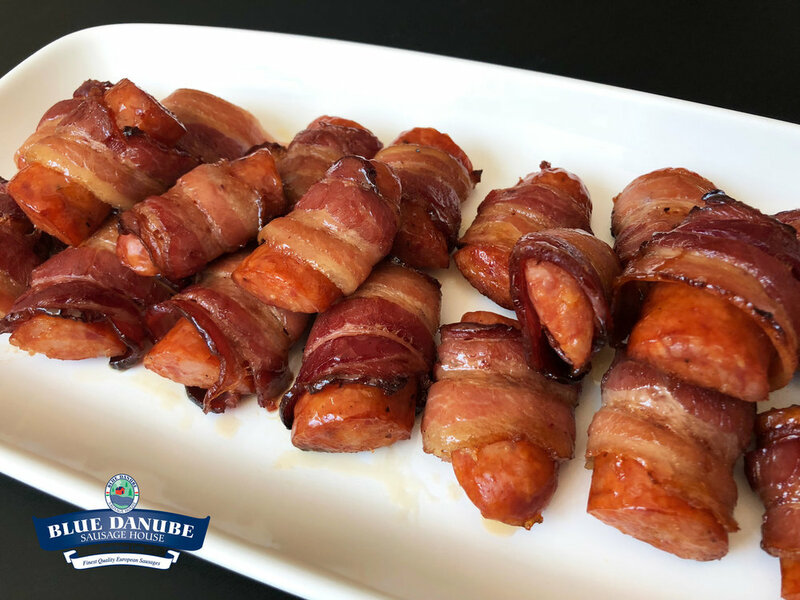 Brush Bacon-Wrapped Debreceni with your Sweet Brown Sugar Glaze. Use approximately half of the mixture. 9. Put the tray in the oven for 15 minutes. 10. Take tray out of the oven. Brush the remainder of your Sweet Brown Sugar Glaze onto your Debreceni. 11. Put the tray back in the oven. 12. Take tray out of the oven and let cool for approximately 10 minutes.